We experience the mercy of God when we least expect it. Acts of kindness and care always shows fruitful results. At times of distress, if you pray with all your heart, you prayers are heard by the Almighty. Prayers are surely heard and they work. When you realize that your prayer has been answered, that is the time you realize that God is real. That is your God moment. Such a moment was felt by a couple, Mike and Melanie Leitner, when their daughter was fighting death. Ella is the name of Mike and Melanie’s daughter. She is a little girl who was suffering from a life threatening condition. She was struggling to survive. Ella’s heart was in such poor condition that she needed an organ transplant. Her heart was in a deadly condition and she was struggling to survive. She was fighting for her life. 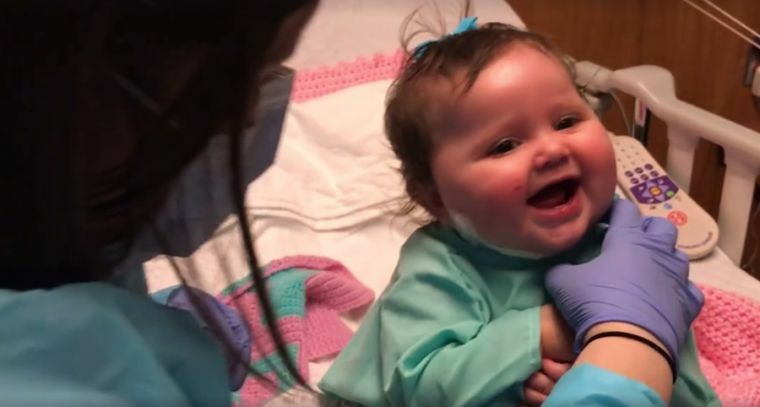 While a new heart for Ella was being searched for, her condition was getting worse. This is when Mike and Melanie turned to faith. That was the last hope left to them. The pastor of their church, decided to stop in the middle of service and pray for Ella and her parents. He informed the entire congregation about the baby’s condition and how it was deteriorating with each passing moment. He told the congregation that the little girl was failing to put up her fight for life and that her conditioning was worsening. The pastor prayed for the child and for the parents. The entire experience of the church was narrated by Melanie to WBTV-TV. While prayers were said in the church, even those at Levine Children’s Hospital was praying for Ella. God heard this prayer and answered it. While Mike and Melanie was returning home from their church, they got a phone call from Celine, the other coordinator. This call changed their world and changed it for the best. Celine informed them that she got the offer of the perfect heart for Ella. Melanie had to admit that this was the ultimate God moment for them. After all this prayer and the heart transplant of Ella going successfully, the baby girl is alive and living a healthy life. She will always know that there was a divine intervention that saved her life. Organ donation is a very noble act. Donating your organ can save someone’s life and thereby save an entire family. Organ donation helps both the donor and the receiver. It helps the recipient by giving him or her an entire new life. If the condition is not fatal, then surely organ transplant gives the recipient a better quality of life. An organ transplant can give some people a longer life, for some it means not having to depend on long, painful and recurring treatment. For the donor it surely gives a sense of satisfaction to think that they could comfort a grieving family. The grief of donating your organ can be alleviated with the comfort of being able to bring a smile on someone’s face. The fact that the donor is being able to save another person’s life is in itself an empowering feeling. Thus donating an organ is a win-win situation for both the donor and the recipient. Eight lives can be saved by one organ donor. A donor who is donating his or her eyes or tissue can save as many as fifty lives. Such is the power of organ donation! In USA it has been found out, that around eighteen people die everyday waiting for their organ transplant. At an interval of ten minutes, a new name gets added to the waiting list. Every year, the count of people waiting for life-saving tissues and eyes is crossing more than one million. In New York more than 27% of the population aged eighteen and above have enrolled their names in New York State Donate Life Registry as a donor for eye or tissue. This percentage in whole of the USA is around fifty. Donation of an organ is only done after the physician has declared a person dead and he or she is not enrolled legally for donation. But before declaring someone dead, doctors try their best to save the person’s life. The factors deciding the recipients’ eligibility to get an organ are: their position in the waiting list, the age, the blood group and finally the severity of the illness. Financial strength or being a celebrity does not influence the eligibility criteria. Donation like any other medical treatment has to take place in a clean and sterile environment. Donation never leads to disfigurement of the donor’s body. It also does not affect the funeral proceedings of the donor. A donor’s family does not need to pay any expenses related to the donation procedure to the hospital. It is illegal and considered to be a crime to buy as well as sell organs in USA. It is the Federal Government in the USA who decides and regulates the laws related matching organ donors with recipient. Donation has no religious segregation. All religions support donation. Organ transplant is a fairly successful phenomenon in medical history. The success rate of organ transplant ranges from eighty to ninety percent.